A master craftsman named Leonidas Pratt poured corn, wine and oil on the first foundation stone of San Jose State’s first campus building, declaring it “well formed, true and trusty.” Yvonne Escalante, ’13 MFA Spatial Arts, considered that momentous day in 1870 and other elements of SJSU history when she set out to design and create the university’s new ceremonial mace. Her philosophy as a craftswoman and SJSU Art and Art History lecturer also helped to shape the meaning of this new piece of SJSU history. Escalante longed for a way to connect with that part of her heritage. After the passing of her grandfather and her father, an aeronautical engineer who painted and “played every instrument he put his hands on,” she decided to explore her family’s heritage and create that connection through her art. 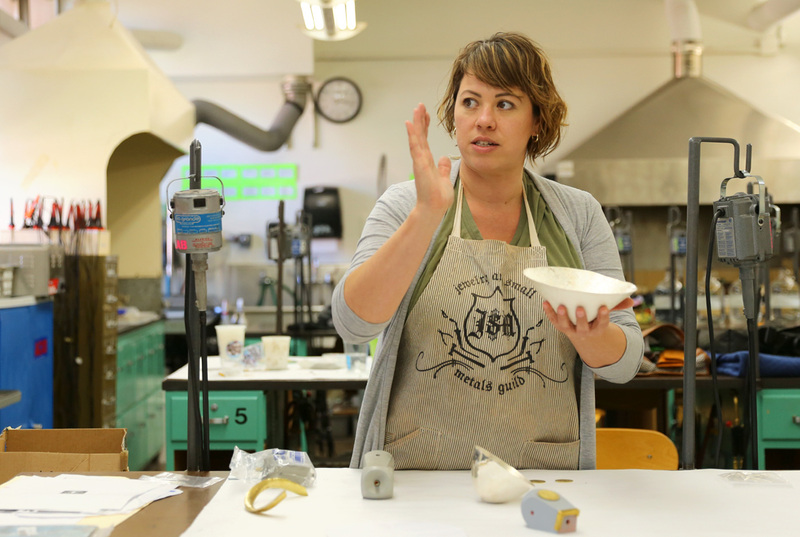 Her investigation into corn, agriculture and farming practices ultimately would become the foundation of her San Jose State MFA thesis and an inspiration for her art. Escalante’s music box, “Reconstructing Time,” allows her grandfather and father to “speak” with a musical language based on how they each ate corn on the cob. 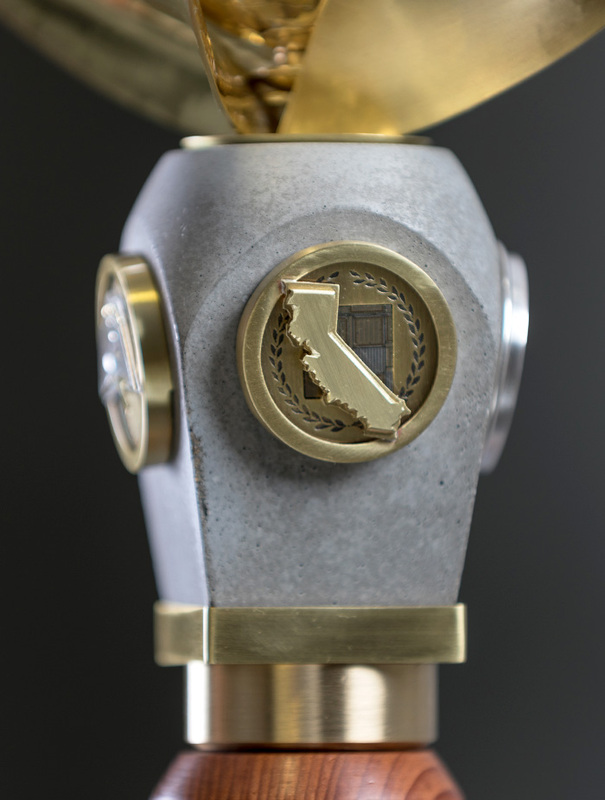 Likewise, Escalante’s work on San Jose State’s ceremonial mace provides a way for generations of university alumni to connect through another artwork. 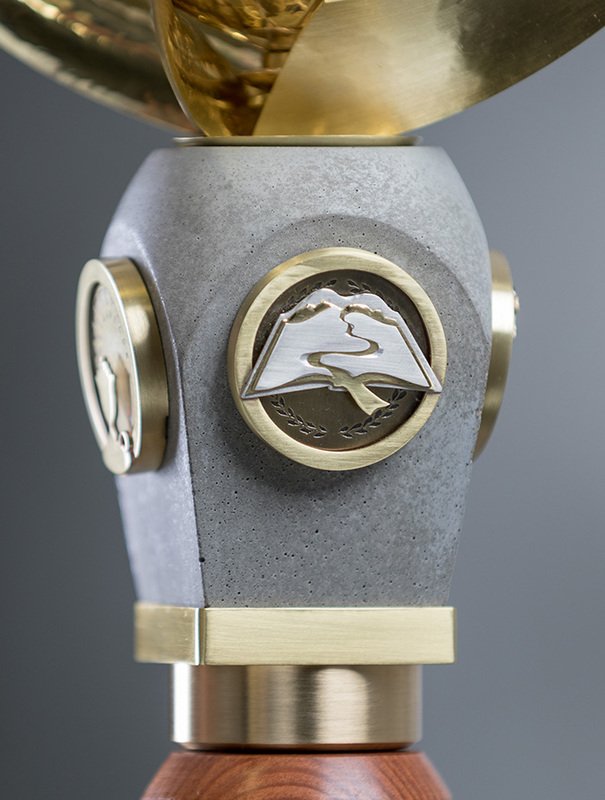 The mace’s elements tell the story of the university’s history and the journey of each student toward graduation. Starting in May 2018, SJSU’s seven college commencement ceremonies will include a new tradition that connects all Spartans—past and future. 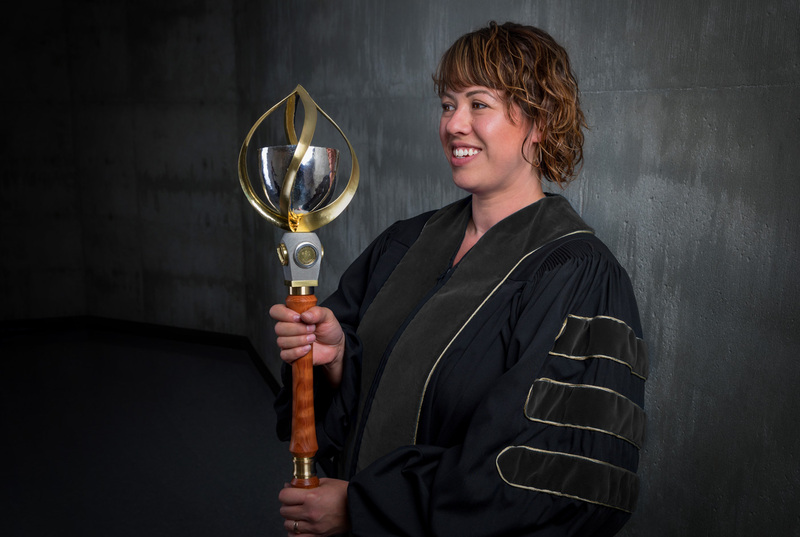 A faculty marshal carrying the ceremonial mace that Escalante created will lead the procession of graduates. A gift from the Tower Foundation of SJSU, the mace was commissioned by SJSU President Mary A. Papazian. 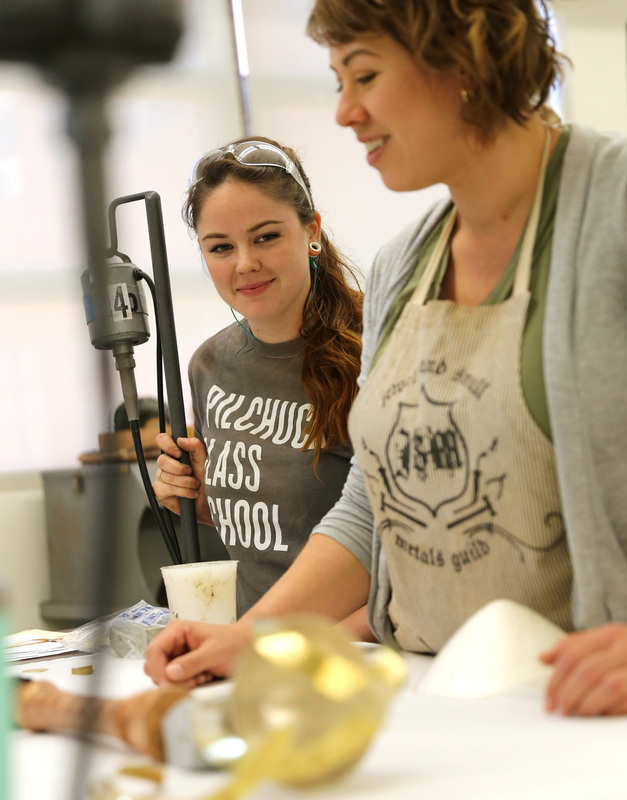 Escalante’s former student, Lauryl Gaumer, ’15 BFA Spatial Arts, assisted with the finishing work on the mace. San Jose State takes pride in the talent and dedication of its students, alumni, faculty and staff. The mace is an example of how collaboration can make SJSU history. Special thanks go to University Art Director Michelle Frey, as well as College of Humanities and the Arts Dean Shannon Miller, Art and Art History Chair Anthony Raynsford, and Jordan Shepard and Lydia Black in the Art and Art History Central Shop for their support and assistance. 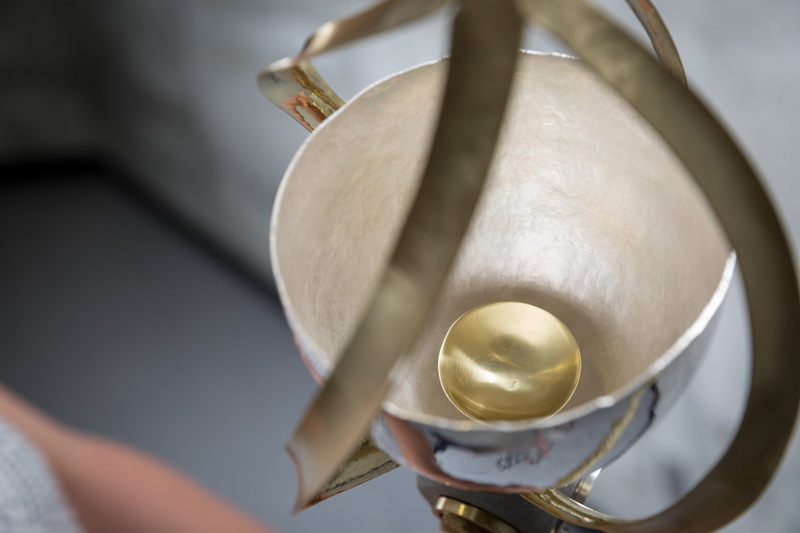 Each part of the mace represents an element of the student’s journey and connection to the legacy and traditions of the university. Holding the mace together is the “spark,” symbolizing the individual power of each Spartan to create his or her own path and to make the world a better place. 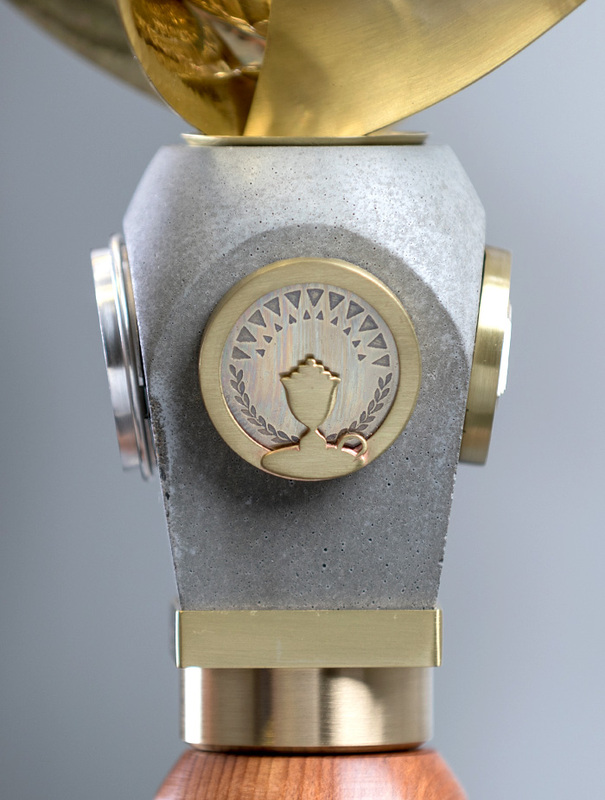 The head of the mace includes a raised silver vessel surrounded by four brass ribbons that rise from a concrete support to form a flame-like structure. A metaphor for the student’s journey, the creation of a raised vessel begins with a flat sheet of silver. Through rounds of forming, the edges are compressed and brought up into a bowl shape. A symbol of open mindedness, the open vessel is filled with knowledge, strength and passion. Like a student’s transformation through education, the vessel’s shape and hammered facets take time and focus to create. The texture of the vessel signifies the diverse fabric of the SJSU community. In the way that education supports a student’s growth, four brass ribbons support the vessel. The ribbons twist and follow the contours of the raised vessel, reaching beyond it toward the sky, giving them an uplifting, flame-like quality. Three of the ribbons represent vox, veritas, vitas, or voice, truth, life, taken from the California State University seal. The fourth ribbon represents SJSU. A strong, rigid material that resists corrosion, brass represents education, strength and steadfastness. 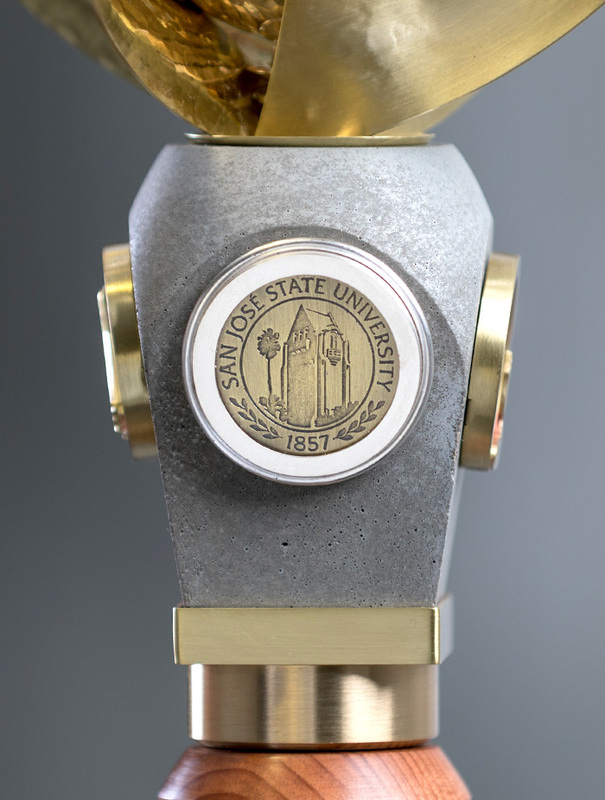 The SJSU official seal marks the front of the mace. The vox or voice coin represents the voice of the state and the people the CSU serves. A silhouette of California is layered with a silicon wafer, symbolizing SJSU’s innovative spirit and location in Silicon Valley. An open book, the veritas or truth coin represents knowledge and wisdom. The book is also a mountain landscape, evoking nearby Mt. Hamilton, and a golden bookmark ribbon becomes a winding path, representing the student’s journey. On the vita or life coin, a lighted lamp is the symbol of higher education. The triangular “bursts” from SJSU’s spirit mark are the eternal flame of a humble household oil lamp used in 1857. The rays of light signify both individual and community spirit. The four coins are set in concrete, symbolizing the bedrock and foundation of SJSU, as well as the strength and endurance of students. The four-sided trapezoidal form flares up to meet the head of the mace and tapers downward toward the staff. In 1870, a master craftsman named Leonidas Pratt declared that the first foundation stone of the first campus building was “well formed, true and trusty.” As he described, SJSU’s foundation is strong. And it is upon this foundation that every Spartan builds. Made of redwood, the staff is made of two 10-inch cylindrical rods joined by a brass collar. Like the California state tree, SJSU is embedded in the state’s history. Representing excellence, California redwoods are the tallest trees and giant sequoias are the most massive. The wood was sourced from a piece of ribboned redwood from a tree that naturally fell near Eureka, California, more than 100 years ago. Inside the vessel, the “spark” has both purpose and meaning. Its purpose is to hold the mace together. Made of hammered brass, it represents the internal glow and individual power that drives students throughout their journeys. What a beautiful tradition to carry current and future SJSU graduates forward. Brava on a job well done!